I have deployed a bunch of servers on Linode since I started using Linodeback in 2008. I have circled around Apache, NGINX, Ubuntu, Debian, CentOS 6 and 7 and in the last couple of years I have stuck to CentOS 7 combined with Centmin Mod. Centmin Mod simply gives me a good LEMP stack to work off yet still leaving room to adjust and modify to our project/clients specifications. Often deploying new servers I want my work to be consistent and with as few repetitive tasks as possible, and this is where a Linode StackScript come in handy. Beyond installing/configuring packages you also have all the other stuff that needs to get done in order to have a production-ready server. You can read more about setting up virtualhosts with Centmin Mod here. 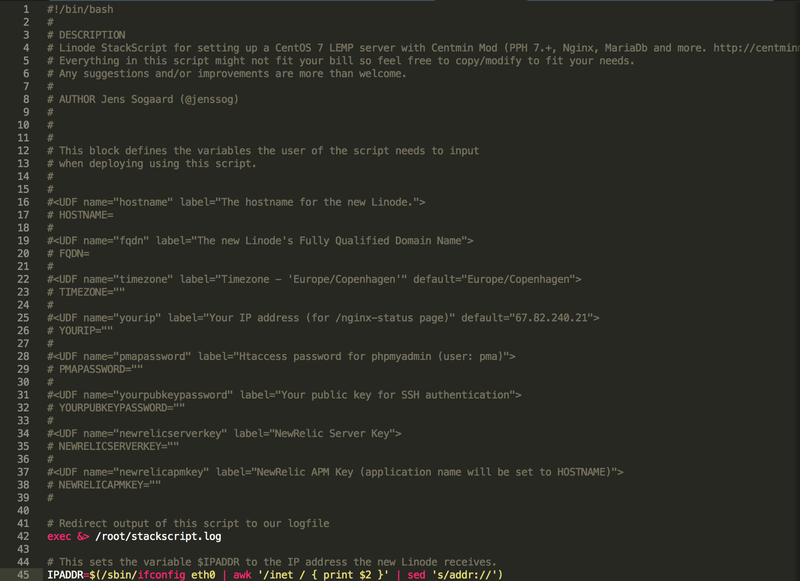 A peak into my Linode LEMP server deployment workflow. Comments and suggestions are more than welcome and I hope you can find some inspiration from this short write-up.